Located on the coast of the Baltic Sea in the North Eastern reaches of continental Europe, Estonia has in recent years shown the world it means business. Outputting such disruptors as Skype, TransferWise, GrabCAD, Pipedrive and, you guessed it, Planet OS, Estonia is well positioned to model a smart society, and we’re not just saying that. We mean it, geographically. Lying in the northern part of a temperate zone, between maritime and continental climate, Estonia is well situated to harness offshore wind. This is not lost of the various companies servicing the Estonian market; since August 2017, Estonian wind production has gone up 36% from the previous year and is set to play a larger role despite a significant uptick in power demand during winter, see below. Simple, wind might have some issues satisfying demand. In a cold place like Estonia daily winter temperatures can dip to −30°C (-22 °F), posing what we hypothesize to be a two pronged issue. First, do lower temperatures prompt lower wind speeds? Second, if wind cannot provide the electricity required to consistently heat a home, how and when will more traditional fuel sources step in to offset demand? Answering this question is paramount to feeding demand, and is underpinned by understanding the value potential of wind generation. 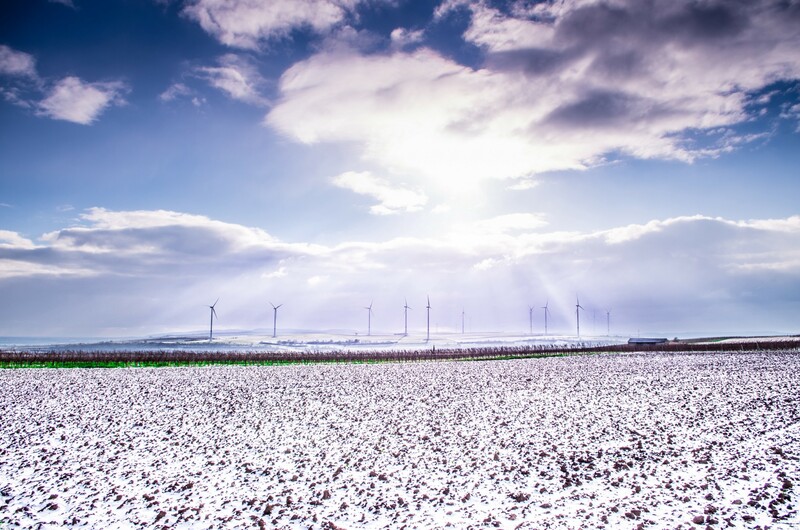 In responding to these questions, this post will focus on comparing temperature and wind speed using data sourced from the The European Centre for Medium-Range Weather Forecasts ERA5 dataset, which we’ve recently added to the Planet OS Datahub. ERA5 Climate reanalysis provides a numerical assessment of the modern climate and is produced through combining models with observations. The dataset contains atmospheric parameters like air temperature, pressure and wind at different altitudes, along with surface parameters like rainfall, soil moisture content, sea-surface temperature and wave height. ERA5 provides data at a considerably higher spatial and temporal resolution than its legacy counterpart ERA-Interim. The Planet OS Datahub allows you to select numerous variables to work with including but not limited to, total precipitation, maximum temperature at 2 meters, and wind velocity at 10 meters. For this analysis we compared the wind speed for January through February over the course of the seven year period between 2010 and 2017. We set 5 m/s as the threshold for generation derived from wind speed. See the total findings below. We then looked at each year individually and identified when demand became relatively high, but wind speed stayed low. During 2010, between January 9th and the 15th, temperature was mostly below -10 C while the wind speed stayed below 5 m/s (red straight line marks 5 m/s) meaning there was a week with high demand and low electricity production. This occurred a few more times during that winter, but only periodically. Over the course of the two month period, only fifteen days occurred when wind speed was weaker than 5 m/s, and for most of those days temperature was below -10 C! Throughout our analysis, this trend continued. In conclusion, there were only 66 days during an 8 year period when wind speed was below 5 m/s. Of those 66 days, air temperature was relatively cold, around -10 or ever lower. So while there were days where high energy demand overcame low production, it really did not make any meaningful difference. Given what we believe the future to hold, more efficient turbines, grids and widespread battery storage, we foresee the days of fossil-fuel needing to compensate for subpar renewable performance grow fewer and farther between. For more detailed examples of how you can use the Planet OS Datahub API to work with high-quality weather data, check out our Jupiter Notebooks or visit data.planetos.com. Thanks to Eneli Toodu and Andres Luhamaa.